Galvanised roofing sheets are becoming an increasingly popular choice when it comes to choosing materials for roofing. Crafted from full prime British steel, all of our galvanised steel roof sheets are available with a standard 3" profile. 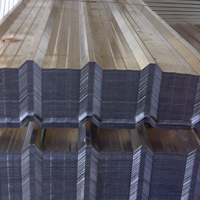 All of our steel roof sheets are available in bulk packs featuring various widths and lengths as well as a choice of 0.5mm and 0.7mm thickness or gauge. The most common benefits of using galvanised steel roofing sheets range from the ease of managing rain fall quickly, to having the reassurance that steel doesn’t rust. Another advantageous benefit is that these packs of sheets aren’t vulnerable to the outdoor elements, insects or algae growth. Our packs of galvanised roofing sheets are much more cost-effective than asphalt shingled roofs and are proven to last longer. 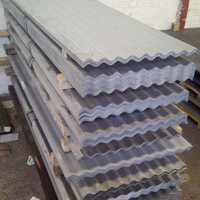 All our galvanised steel roofing sheets are in stock so please call us to discuss your requirements. If you would like to find out more about our range of galvanised roofing sheets, please don’t hesitate to get in touch with our friendly team members today on 01902 229412 or by sending an email with your enquiry to info@bushburycladding.co.uk. Alternatively, you can fill out our online contact form and one of our team will get back to you as soon as possible answering any questions you may have. Not sure if this range is what you are after? Why not take a look at the other products we provide such as corrugated steel roofing sheets, flashings, GRP clear roof lights and wall cladding sheets?